The other day while at the mall I spotted a really cute white and black blazer on sale. When I grabbed it, I realized it had a couple of pen marks. I tried looking for another one, but it was the last one left...NoooOOoooOO! I decided to buy it anyways and see how I could remove the ink. I had never tried removing ink before, so when I got home I started googling ways to do so. I read that hairspray would do the trick, so decided to give it a try. I sprayed a small amount of hairspray directly on the ink stain and waited about a minute (you can also try applying it on a Q-Tip first). I then grabbed a damp cloth and starting dabbing at the stain. After doing this a couple of times....voila! 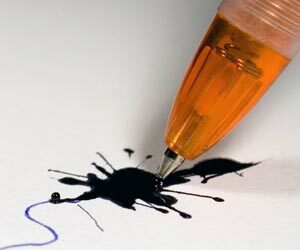 the ink stain had magically disappeared. Do you have any tricks up your sleeve on how to solve wadrobe malfunctions you'd like to share...maybe removing deodorant marks or getting gum out of clothes?